The new realities of the digital workplace have rekindled the evolution of learning and work. Rallyware’s annual research in L&D trends, covering 14 industries across North America and Europe, traced changes in the way businesses adapt to the Future of Work. 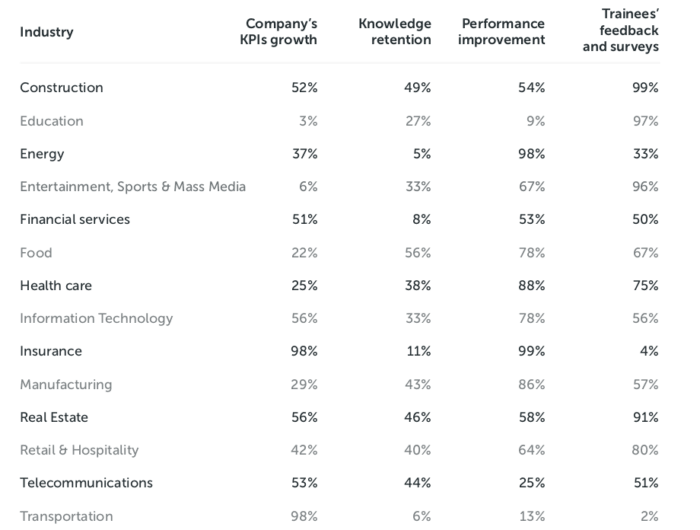 The 2019 study revealed a number of talent development trends, challenges, and tools used by successful companies to solve them. 58% of L&D professionals indicated boosting performance through training to be the #1 challenge. At the same time, more than half (56%) keep measuring the success of L&D programs by training completion rates, not by their actual impact on performance. How can one talk about improvements in employee performance if the majority of training leaders don’t use the right measurements to calculate training ROI? Note that the percentages are almost equal between L&D professionals who struggle to drive performance and those who consider training completion rates to be the most important measurement. Other insightful findings of Rallyware’s 2019 Talent Development Trends Report provide a set of actionable insights to ensure companies’ readiness for the Future of Work. In 2019, companies are looking in a number of directions to increase their adaptability to future challenges and opportunities and to boost business growth through in-house talent development. The aspect L&D professionals pay the most attention to is selecting the right learning tools. Specifically, according to the Rallyware study, 78% of training leaders are not satisfied with the solutions they currently have and are in the process of adding modifications to their learning technologies. In the meantime, 35% of L&D professionals have already implemented hands-on learning technology to increase the efficiency of their training programs and solve the most urgent 2019 L&D challenges such as boosting performance (58%), improving knowledge retention (56%), increasing training effectiveness (53%), and interpreting training results (51%). Such a pressing necessity is explained by the fact that companies are moving towards a much deeper integration of L&D programs into daily employees’ routines to match the pace of changes in a dynamic business environment. Training leaders became more demanding not only towards L&D technology but also in regards to the success criteria for learning effectiveness. In particular, we found that 64% of L&D professionals measure the success of L&D programs by job competence. This shift in focus attests to the fact that the majority of training leaders are now evaluating the results of training programs by long-term improvements in employees’ performance that testify the accomplishment of specific business goals. Besides that, 78% of L&D leaders attribute their success to the ability to boost performance growth. By knowing which learning events in training programs have led to performance growth, L&D professionals will gain a better understanding of how to plan and design successful developmental efforts. We’ve set up four major success criteria for L&D initiatives and discovered an interesting trend observed across 14 industries. Industries where compliance requirements are the most rigorous measure the effectiveness of training programs by KPIs growth and improvements in performance in the first place. In comparison, employees’ feedback and levels of satisfaction are the highest priority in industries that are less burdened with compliance policies. Everything new is well-forgotten old. Our findings revealed that 73% of companies put personalized learning experiences above all other trends to develop talent effectively in 2019 and beyond. Such a high interest in personalization is the result of a need to build agile workforces with flexible skill sets who will be ready to embrace jobs that don’t exist yet. The ultimate goal for companies is to ensure they’ve got the right talent at hand even before there’s a need for a new job role. In a move towards a digital workplace culture with all-time high levels of talent shortages, there’s a high chance for any company to face human capital challenges at some point. How these are addressed will determine their business success, competitive ability, and productivity growth. If you want to discover further insights from the Rallyware Talent Development Trends Research, you can download the report here. Ask us for a demo of Rallyware’s data-driven training platform to see live how we can help your company come out with flying colors in preparation for the Future of Work!